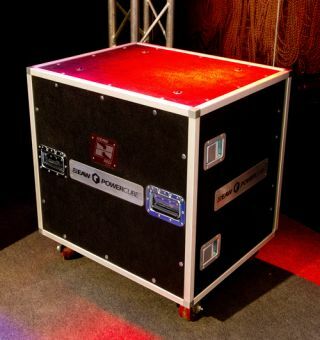 EAW® has announced the release of their Powercube™ amplifier racks. Designed to maximize the capabilities of EAW’s Line Arrays, each Powercube amplifier rack includes electrical power distribution, 12 channels of amplifier power with integrated digital signal processing and 12-channel input and output. The input panels allow for maximum flexibility without switching the connectors. The input panels provide analog connections with loop through, AES connections with parallel loop through and dual Ethernet ports for loop through the amplifier’s digital network. Selectable ground lifts located on each analog input allow it to be linked to the next successive input in series, allowing a single input to drive multiple channels of a multi-amp system. Likewise, Powercube output panels feature both Neutrik® NL4 connectors and NL8 connectors that combine amplifier outputs. This allows for Powercube to drive KF760s, KF740s or KF730s without ever rewiring the amp rack. All models feature a Littlite® gooseneck lamp on the back of each rack for easy patching and configuration in dark areas. They include easily accessible courtesy power outlets appropriate to their voltage to power personal electronics or charge wireless devices. Finally, all models except the Powersoft 230V version include a locking storage drawer.